Arizona Public Service Co. announces a request for proposal for energy generated from small renewable projects. The solicitation is part of APS's Small Generation Program, which is designed to accelerate the number of successful small renewable generation projects by streamlining the proposal and contract procedures. Interested parties are encouraged to participate in a bidder's conference May 20, 2010. Additional information about the teleconference and the RFP is available online at www.aps.com/rfp. 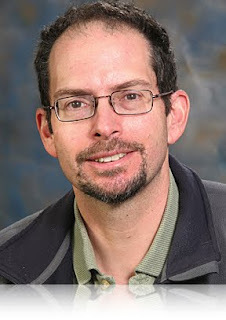 Jonathan Lunine, a planetary scientist at the Univ. of Arizona, is one of 72 new members elected to the National Academy of Sciences. Jonathan's bio lists his research interests to include "the evolution of giant planets and brown dwarf stars, the formation of planets, the evolution of Titan’s atmosphere and surface processes, and organic chemistry leading to the origin of life." Jonathan is an "interdisciplinary scientist on the Cassini mission to Saturn and on the James Webb (Next-Generation) Space Telescope. He is a co-investigator on the Juno mission under development for a launch to Jupiter, and on a Spitzer Space Telescope team investigating the evolution of planet-forming disks." Gov. Brewer also vetoed HB2215, "which would have created a method of industrial and commercial valuation of retention basins and set the value of retention basins at $500 per parcel," according to the Arizona Capitol Times. 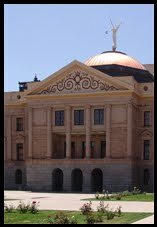 The wide-ranging mining bill HB2617, has been approved by the Arizona legislature after some significant amendments, and is its way to Gov. Jan Brewer for her signature. The bill was intended to streamline state regulation and permitting processes to speed up approval of mining projects. One of the more high-profile parts is the requirement that state agencies cannot make rules more stringent than federal rules without legislative approval. The bill creates a Mining Advisory Council that originally had powers to direct how agencies would operate but floor amendments changed that to an advisory role in assisting state agencies in formulating rules. Freeport McMoRan Copper & Gold will hire 400 workers for its Morenci copper mine in eastern Arizona [right, my photo May 2008] according to a report in the Arizona Daily Star. In addition, the company will reopen the Miami mine in 2011, and will need 250 construction workers for its sulfur plant at the Safford mine. HB2251, to transfer the Arizona Mining & Mineral Museum to the Arizona Historical Society to become the Centennial Museum is on the House "Concur and Final Passage" calendar this afternoon. It passed the Senate earlier this week. The Vug has posted its extensive set of articles and accompanying photos from this years Tucson Gem & Mineral Show. Articles 252 through 279 showcase each of the display cases from the 4-day show, with descriptions and histories. 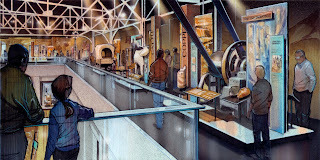 The bill to transfer the Arizona Mining & Mineral Museum to the Historical Society to become the Centennial Museum, HB2251, passed the Arizona Senate yesterday with a number of changes, some of which appear to be unintentional. But the Legislature is planning on adjourning as early as Thursday, leaving a large number of bills in limbo. So it's unclear to me if the bill can get through the House in time, or if the needed changes can be made before sine die. A floor amendment from Sen. Sylvia Allen was adopted that transfers the AZ Dept of Mines & Mineral Resources budget for the museum to the Arizona Historical Society but only to cover the cost of one curator and not the rent. The rent cost is assigned to the Dept of Administration but they are given no funding to cover it. Opponents of the bill also criticize the provision that allows the mineral museum curator to be anyone with a museum background but not requiring expertise in minerals. An advisory subcommittee would be established with members of the ADMMR board but the Board would lose the ability to hire and fire the ADMMR director. That power would go to the governor. UA geosciences professor George Gehrels will receive the Geological Society of America's Day Medal at the 2010 GSA annual meeting in Denver on Oct. 30. The Arthur L. Day Medal was established in 1948 by Arthur L. Day to be awarded for outstanding distinction in contributing to geologic knowledge through the application of physics and chemistry to the solution of geologic problems. 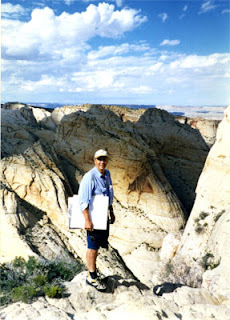 Yesterday we learned that UA geoscientist George Davis will get the GSA Structure & Tectonics Div. Career Contribution Award. 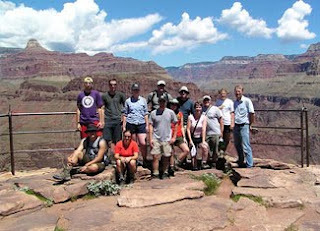 With the department just identified as the #1 geology grad program by US News & World Report, it's been a good week. A 5-foot diameter boulder careened down a steep slope in Oak Creek Canyon last June, bouncing past the homeowner, destroying a pump house and damaging other out buildings, before coming to rest in the rose garden without harming a single plant. 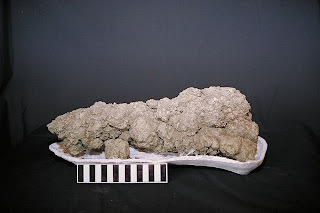 AZGS geologist Brian Gootee investigated the event and wrote a short report for our online magazine, Arizona Geology. 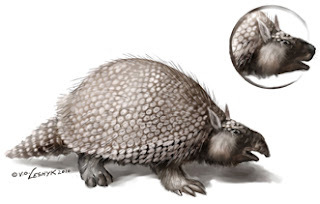 Dave Gillette, paleontologist and curator at the Museum of Northern Arizona has authored a wonderful description of this creature and its prominent role for nearly 2 million years in this region, as the feature article in the AZGS Spring issue of Arizona Geology online. The award will be given at the SG&T business meeting of the GSA annual meeting in Denver this year, Tuesday evening, November 2nd. "On Monday, April 26th, I will wear the most cleavage-showing shirt I own. Yes, the one usually reserved for a night on the town. 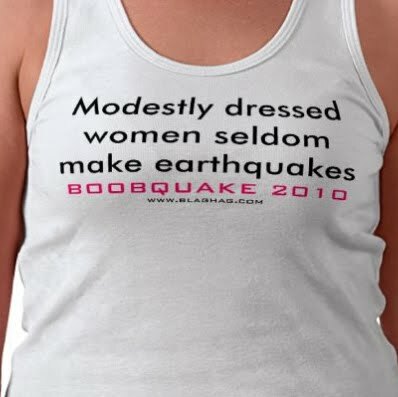 I encourage other female skeptics to join me and embrace the supposed supernatural power of their breasts. Or short shorts, if that's your preferred form of immodesty. 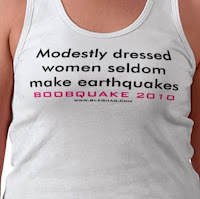 With the power of our scandalous bodies combined, we should surely produce an earthquake." 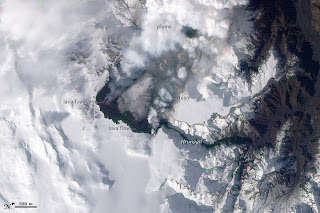 So, what have we done to cause the volcano to erupt in Iceland? When the religious leaders of Iran and Pat Robertson are in agreement, it may be time to put on a burqa and hide in the closet. The Southern California Seismic Network's latest update on the Easter Sunday M7.2 earthquake list at least 3,000 aftershocks, with 758 having a magnitude 3.0 or higher (as of April 12). 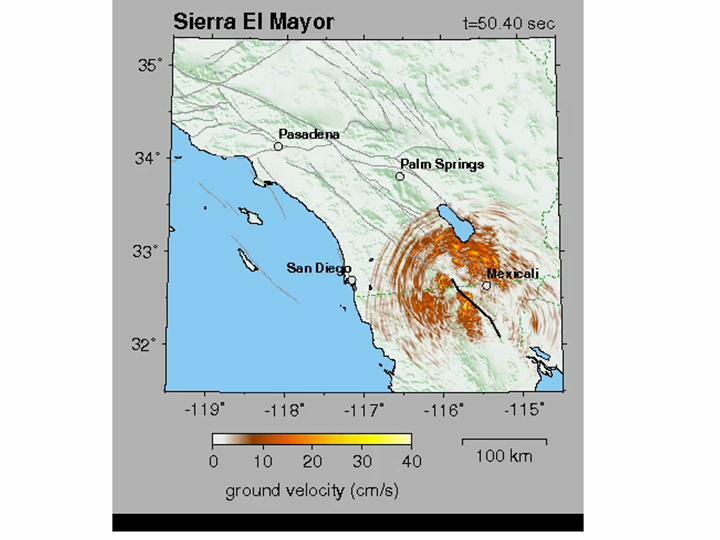 They also report that the organizations involved in researching the quake have officially named it the El Mayor - Cucapah Earthquake, after processing "data that showed a trend along the face of the Sierra Cucapah Mountains, north of the Sierra El Mayor mountain range, near where the mainshock was originally located." 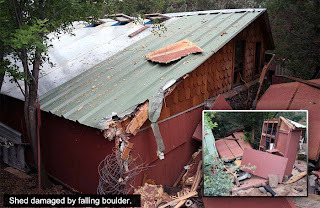 Meanwhile, the Yuma Sun reports that the quake destroyed nearly 150 homes around the town of San Luis Rio Colorado, Sonora. The number of injured is listed as 233 with 2 dead. Two recent reports paint a scary picture about the world oil supply. The Joint Operational Environment (JOE 2010) study from the Dept. 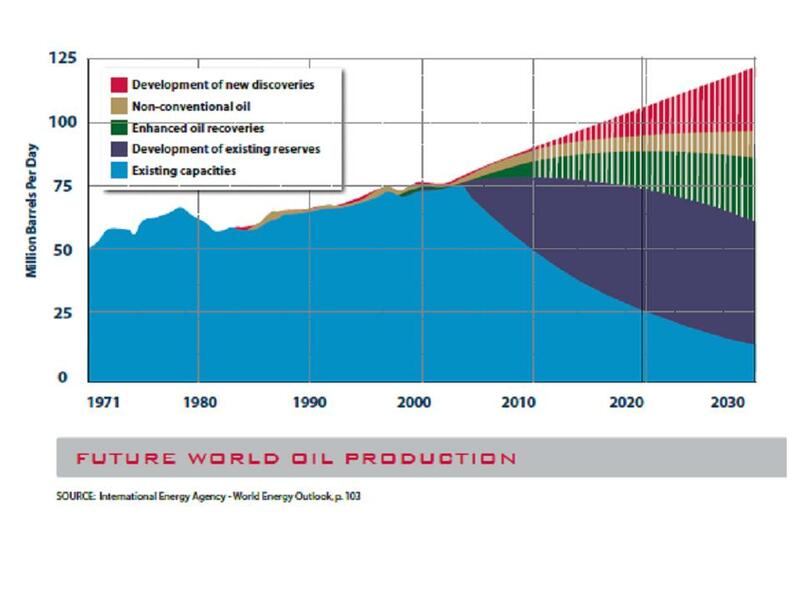 of Defence concludes that, "By 2012, surplus oil production capacity could entirely disappear, and as early as 2015, the shortfall in output could reach nearly 10 MBD." Second, a report by Kuwaiti oil experts revised the Hubbert peak oil model to consider the impacts of technology, politics, and other factors. A brief description on Science Daily said they "evaluated the oil production trends of 47 major oil-producing countries, which supply most of the world's conventional crude oil. 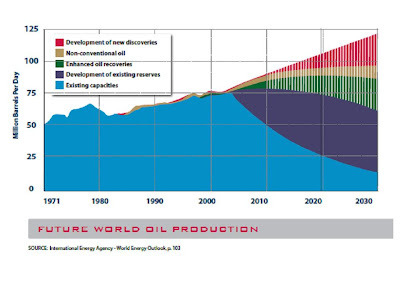 They estimated that worldwide conventional crude oil production will peak in 2014, years earlier than anticipated. The scientists also showed that the world's oil reserves are being depleted at a rate of 2.1 percent a year." My view of the Hubble curve is that it may work for individual basins or simple production models but that globally, there are too many other factors that make it unrealistic. So, this new approach may have merits. The JOE study covers a wide range of topics and "provides a perspective on future trends, shocks, contexts, and implications for future joint force commanders and other leaders and professionals in the national security field." "...rivers from mountains to the east of the Grand Canyon poured water into a giant basin, larger than Lake Michigan today. 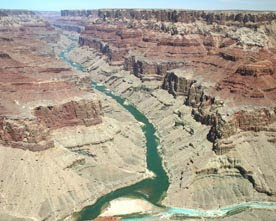 Once the water reached the top of the western rim of the lake, it spilled over onto the plateau where the Grand Canyon currently is." The Federal Energy Regulatory Commission continues to evaluate a plan to create caverns in the Picacho basin salt deposit to hold natural gas for use during peak periods. The plan by Arizona Natural Gas Storage LLC, would dissolve the salt and evaporate the brine in surface ponds. There have been a couple of public meetings in the region where some questions were raised about the salt deposits. The first photos suggested by the public from the HiRise camera on the Mars Reconnaissance Orbiter have been released by Univ. of Arizona. The "HiWish" program evaluates recommendations from the public and chooses those that offer good scientific rationale. UA planetary scientist and lead scientist for the project Alfred McEwen says they are looking for "fresh thinking outside the box." "we use an oxygen isotope record from a speleothem collected from the Cave of the Bells, Arizona, USA, to reconstruct aridity in the southwestern United States during the last glacial period and deglaciation. We find that, during this period, aridity in the southwestern United States and climate in the North Atlantic region show similar patterns of variability. 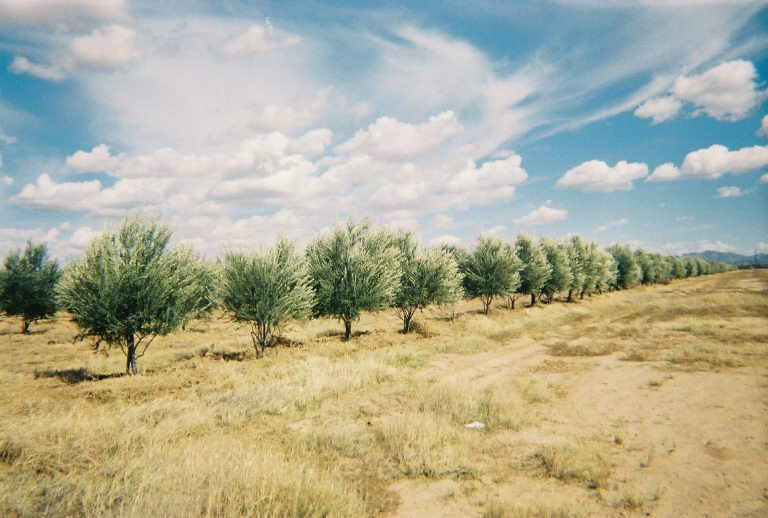 A similar response to future warming would exacerbate aridity in this already very dry region." "Our data are consistent with modern evidence for a northward shift of the polar jet stream in response to global warming, which could lead to increasingly arid conditions in southwestern North America in the future." Here at the Arizona Geological Survey, we opened two more positions for our DOE-funded project to help build, deploy, and populate the National Geothermal Data System among all 50 states. The project is scheduled to be formally launched on May 4. Job applications must be made through the State of Arizona jobs site (urls below), but we request that resumes also be copied to us directly at resumes@azgs.az.gov , with the subject line: "JOBTITLE - YOURNAME" (insert which position and your name as appropriate). We are seeking a student intern to provide Project Management support to management, project team and subcontractors under minimal supervision. We are seeking a computer systems support specialist to maintain AZGS and National Geothermal Data System computer hardware and software in good working order, assisting users with technical problems using this hardware and software, and assisting AZGS personnel and National Geothermal Data System clients with use of web services for information access. In the coming weeks we will also be recruiting for a Data Base Manager, 2 Web Service Programmers, a Technical Writer, and a number of part-time data entry technicians and digitizers. Phoenix-based Freeport McMoRan Copper & Gold reported 1st quarter profits up 20-fold, from $43 million last year to $897 million this year. The company will double its stock dividends according to a lengthy analysis on Mineweb. CEO Richard Adkerson is reported saying that global demand is picking up for copper, so the company is getting ready to ramp up production at the Morenci mine which had been cut in half to 500,000 short tons a day. Adkerson is quoted, "We are looking at increasing our performance at Morenci [right], which had been cut significantly by 20% and we are very encouraged that we are being able to find good workers to come back into the work force." He also said that a sulfur burner project at the Safford, Arizona mine, will greatly reduce the company's need to buy sulfuric acid in the market place and give them more flexibility. There's a related story about Freeport's significant gold production, which amounted to 478,000 ounces last quarter. 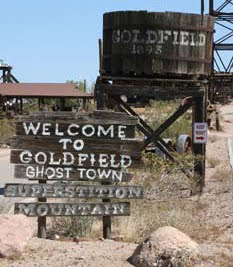 Freeport continues to focus on copper rather than pursue gold production as many others are doing. 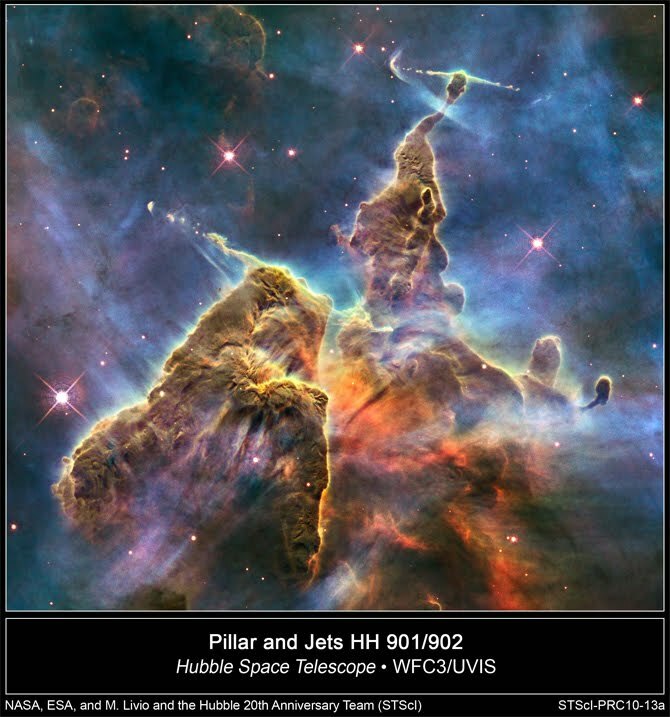 Like most of us, I am repeatedly dazzled by the images returned by the Hubble space telescope and new understanding of the universe that they provide. 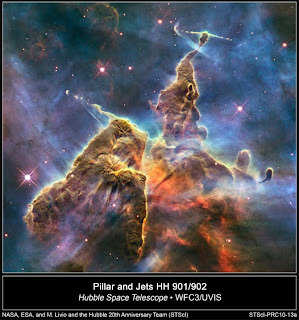 I feel a personal tie to Hubble because I was at the Cape for it's launch. A friend was on the crew and invited me to watch from the VIP area which offered one of the best and closest views. The night before the launch, a number of us got the privilege of going out to the base of the Space Shuttle launch tower. It was completely bathed in flood lights. As I stepped off our shuttle van, I was frozen to the spot in awe. It's an image that still staggers me. And now, 20 years later, I say bravo to everyone involved in taking us to the edge of the universe and beyond our imaginations. 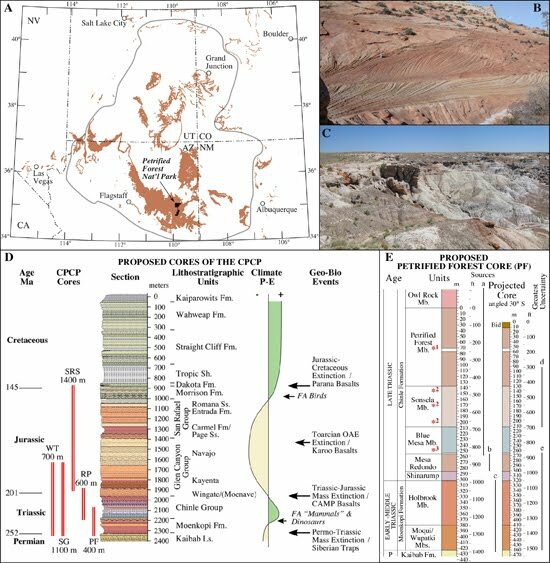 In a short report in EOS from a workshop held in New Mexico last year, John Geissman et al, wrote that "The Petrified Forest core, about 460 meters in length and HQ gauge (~6.4 centimeters in diameter), will provide a robust reference section where geochronologic, magnetostratigraphic, environmental, and paleontologic information can be registered..."
When complete, the core will be archived at the Rutgers University Core Repository. 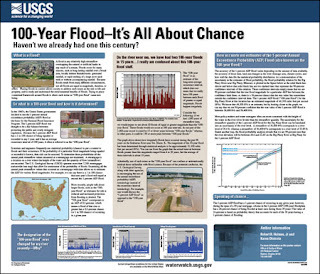 Why do we have 100-year floods more often than once every century? Frankly, I have a hard time expecting the public and news media making this change, even if the scientific and technical communities adopt it. The HiRISE camera on the Mars Reconnaisance Orbiter, managed by the UA, released a photo of two adjacent craters on Mars with smiley faces reminiscent of the muses of theater. "The muse of tragedy, Melpomene, wore the sad mask, and the muse of comedy, Thalia, wore the happy mask." 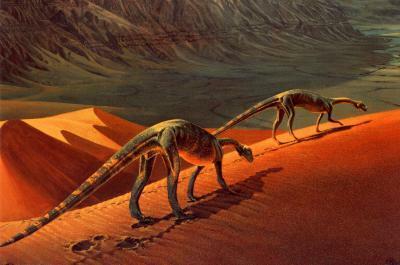 Project staff Ken Herkenhoff suggests the curved features are wind-blown sand dunes in the crater bottoms. An email update from Resolution Copper reports that "On March 18, 2010, Congresswomen Ann Kirkpatrick introduced complementary legislation into the House of Representatives. The rewritten legislation reflects changes agreed to by bipartisan members of the Senate Committee on Energy and Natural Resources in December 2009." S-409 would exchange 5,500 acres of prime conservation lands for US Forest Service and other lands needed to develop the underground copper mine. Peabody Coal's Kayenta surface mine in Arizona is one of 48 mines nationwide called dangerous by California Congressman George Miller, who says there are backlogs of contested safety citations. 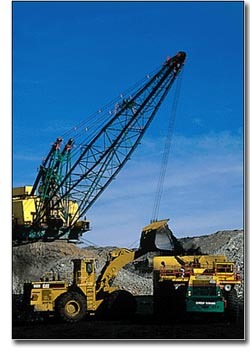 Peabody is headquartered in St. Louis, where the local paper reported that "MSHA records indicate the mine logged more than 1 million hours without a lost-time incident in 2009, and its safety rate was far better than the national average for U.S. surface mines." 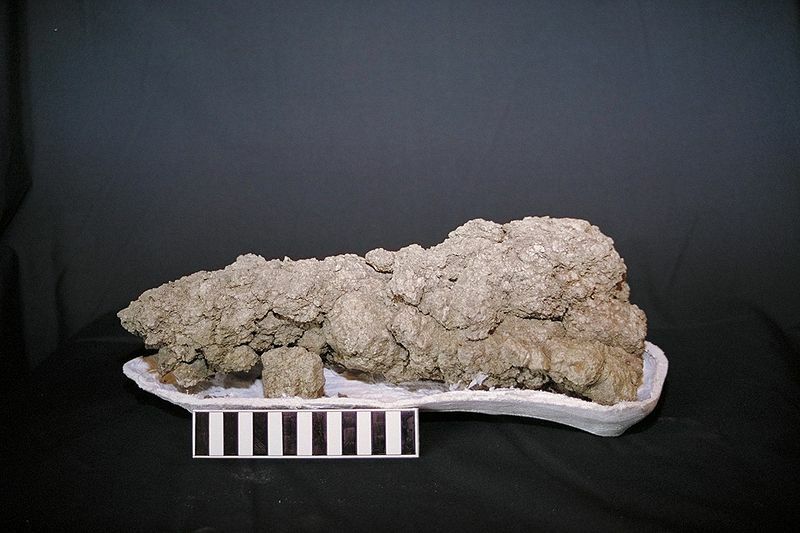 A Peabody spokesperson said she did not know why the Arizona mine was included on the list. Thanks to Geology.com for posting this news. 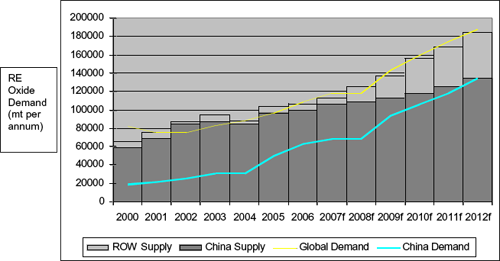 Presentations by Molycorp, owner of the Mountain Pass rare earths mine in California, show that China's demands for rare earths are rapidly approaching the total world production, 97% of which they produce (right). The General Accounting Office warned key Congressional committees that the U.S. lacks the ability to process rare earth minerals used for a wide array of electronics and national defense products. 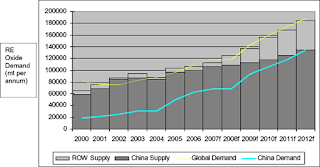 Last year, China produced 97% of the world's rare earth oxides. The study noted it takes 7 to 15 years to develop new mines in the U.S., with Mineweb saying "factors which may impact the rebuilding of a U.S. rare earth supply chain would include capital investment, the ability to develop processing plants, and environmental concerns which could make rare earth minerals extraction difficult and costly." 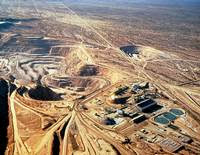 The Mountain Pass mine in California is seen as the only US mine that could be producing by 2012. 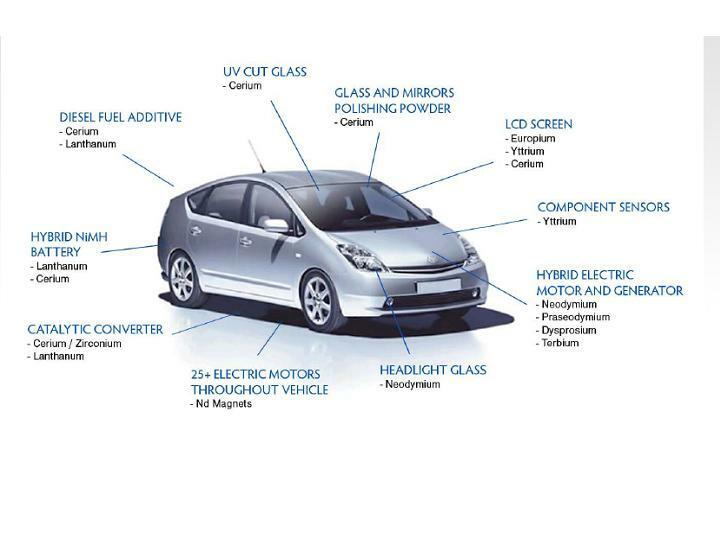 The US still lacks the processing capability to refine the oxides to metals. Last year's budget cuts forced the Arizona Dept of Water Resources to stop funding for 19 stream gauges and another 33 are at risk of being shut down this year. Steve Ayers, reporter with the Verde Independent, describes efforts among 37 cooperating agencies to fund support to keep the network running. 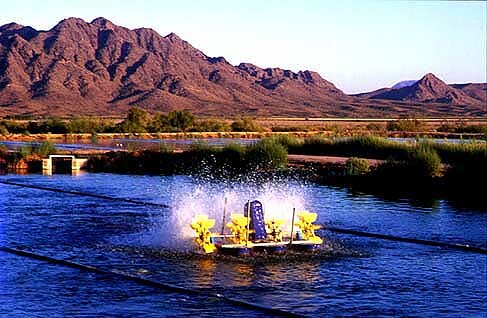 The USGS maintains a network of 200 stream gauges across Arizona but in the last two decades have increasingly turned to states to pick up more of the costs of maintaining them. 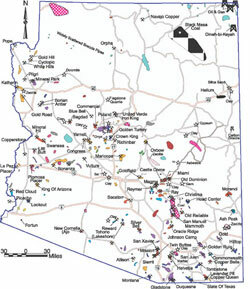 Arizona is viewed as generally supportive of mining or at least not creating too many deterents, in an annual survey of mining company executives. Arizona ranks 25th out of 72 jurisdictions worldwide, up from 27th last year, but down noticeably from 14th position in 2007-8. 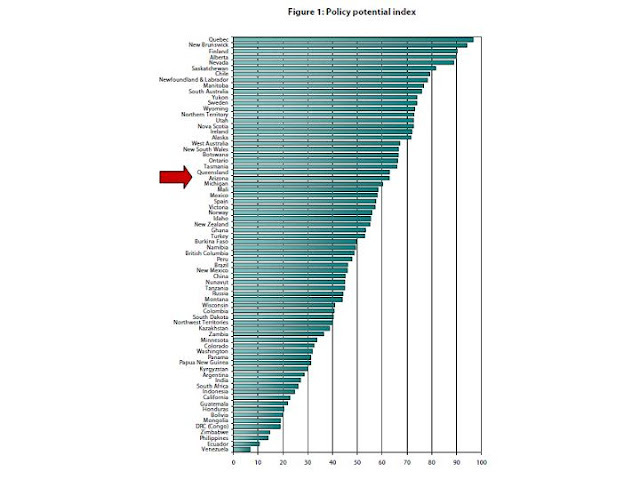 Four other states are ranked higher - Nevada, Alaska, Utah, and Wyoming. The highest ranked area is the Canadian province of Quebec. Lowest ranked among the group is Venezuela. One factor they track (p.80) is "Quality of geological data base (includes quality and scale of maps, ease of access to information, etc.)" 83% of respondents gave Arizona the top two ratings in this category. Colorado, New Mexico, and Utah had slightly higher numbers but the percentage who gave them 1's was less than for Arizona. The Canada-based "Fraser Institute has conducted an annual survey of metal mining and exploration companies to assess how mineral endowments and public policy factors such as taxation and regulation affect exploration investment. Survey results represent the opinions of executives and exploration managers in mining and mining consulting companies operating around the world." "The survey now includes data on 72 jurisdictions around the world, on every continent except Antarctica, including sub-national jurisdictions in Canada, Australia, and the United States." US News & World Report ranks the University of Arizona Geosciences graduate program the tops in Geology in the nation, tied with the Univ. of Michigan. In the last rankings, UA was #7. In the new Earth Sciences comparison, UA ranks #7 and ASU came in at #17. Former Northern Arizona University paleontologist Jim Mead has been singled out by Popular Science as having one of the 10 worst jobs in science. In their annual collection, PS described Mead's collection of 13,000 dung samples from extinct sloths to modern porcupines that are in used in a variety of research and practical studies (e.g., climate changes, animal health, environmental conditions). The crowd for today's Renewable Energy Summit put together by Gov. Jan Brewer at ASU's Skysong center in Scottsdale, is so large that I am among 50+ participants who are viewing it by video across the courtyard in another conference room. State Land Commissioner Maria Baier and BLM State Director Jim Kenna offered some opening figures on Arizona's electric power status. Arizona's electric capacity was 25,861 megawatts in 2008. To meet the state's Renewable Portfolio Standard of 15% of electricity from renewable energy, we need about 4,000 megawatts from solar, wind, geothermal, and biofuels. To date, there are applications for about 2,500 megawatts of renewable energy projects in Arizona. Jim raised the questions that governments are dealing with, of where do we put these projects, and how do we manage the process in making these decisions.